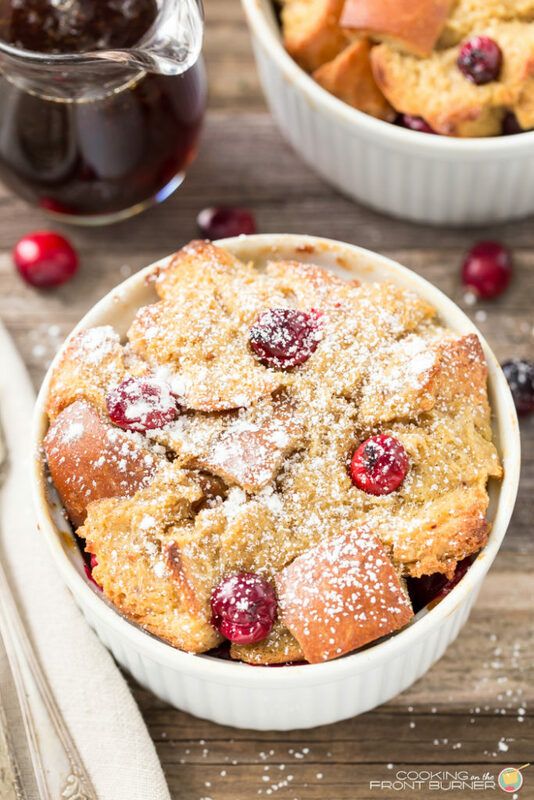 Overnight Eggnog French Toast recipe is the perfect make ahead meal for a holiday brunch. 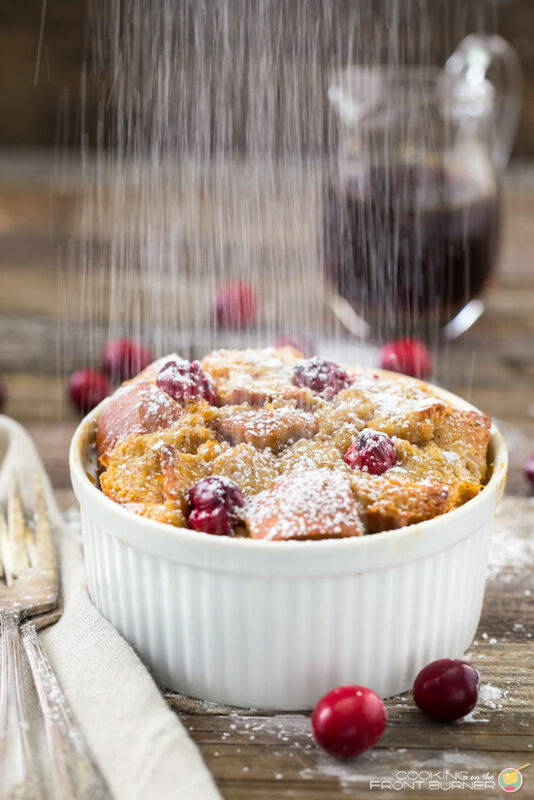 It is full of flavor with creamy eggnog, tangy fresh cranberries and crunchy pecans, all topped with an Orange Maple Syrup. I’m not sure about you but I have been super busy these last two weeks with getting it all done for the holidays. Running from here to there, shopping, wrapping, baking and even working (cuz, oh yeah, I still need to do that!) 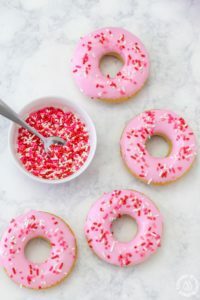 I’ve been MIA in the kitchen and haven’t had a new post in about ten days and have really missed it. So today I’m real excited to share this new festive recipe for you just in time for the holidays. Oh please say it was worth the wait! 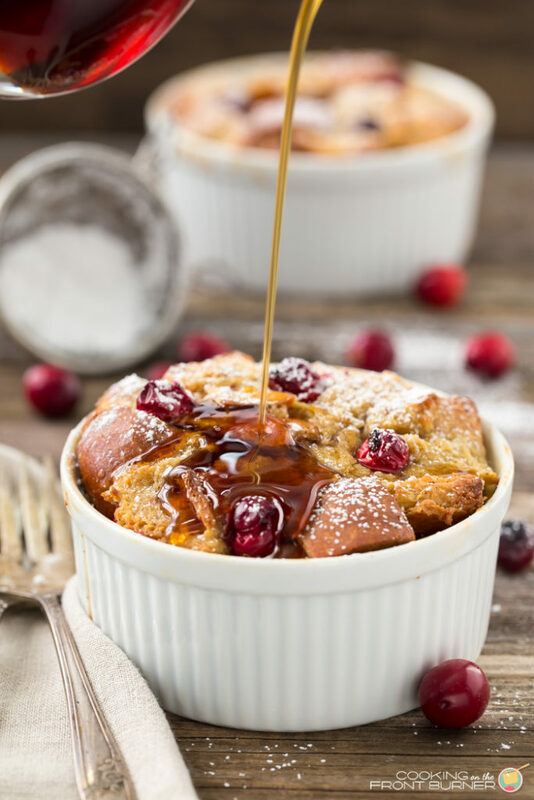 You will love how easy this recipe overnight eggnog French toast is and want to add it to your brunch or breakfast table. Even though it’s been a busy time getting ready for the holidays, we did have a fun weekend away in New York City. I’ve always wanted to see Christmas time in NYC and it did not disappoint. We crammed as much in as we could for 48 hours – seeing Rockefeller Center (both at night and during the day), Times Square, The Lion King (fantastic), the Rockettes (equally fantastic), Macy’s, Chelsea Market, Bleecker Street Pizza, Bantam Bagels, dinner at two fab restaurants Bar Americain (Bobby Flay’s) and Masseria dei Vini. We also walked around a lot to take in the decorations and do some window shopping. It was so fun and I would highly recommend visiting if you ever get the chance. You might recall a post I did when I visited in June this year also. I guess you can say I love New York! 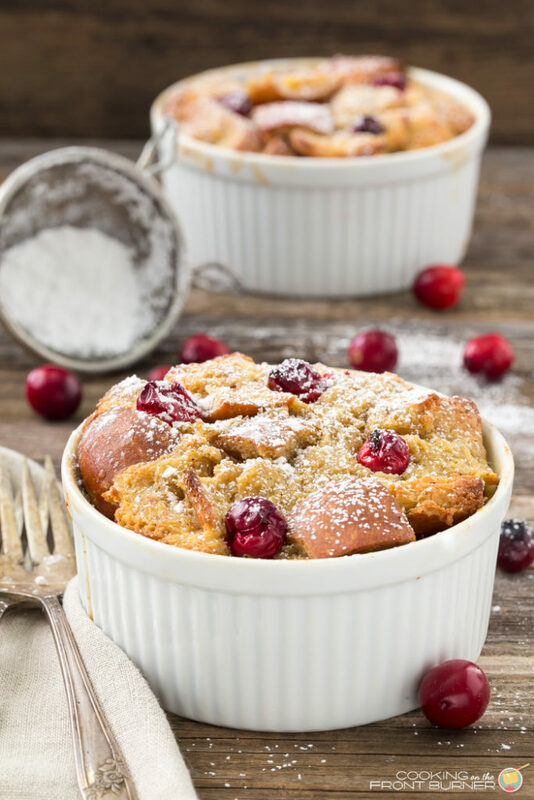 You can also say that I love this overnight eggnog French toast recipe. I’ve made this type of recipe before but the base was always just eggs and milk. 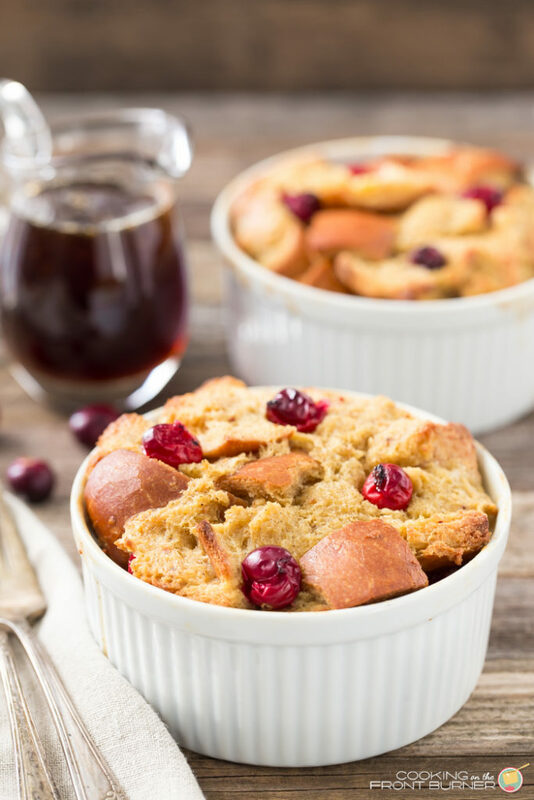 This is really quite flavorful with the eggnog – it’s just not for drinking! The fresh cranberries make a nice contrast too along with the pecans. But what really melds it all together is the Orange Maple Syrup. 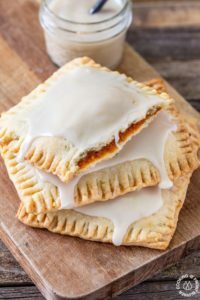 Wow, it’s perfect and easy to make. Assemble this the night before and just bake for about 35 minutes and then enjoy!! I wanted you to see the eggnog French toast prior to any toppings – which of course you could eat plain too. It’s also fun to dust the eggnog French toast with some powdered sugar. 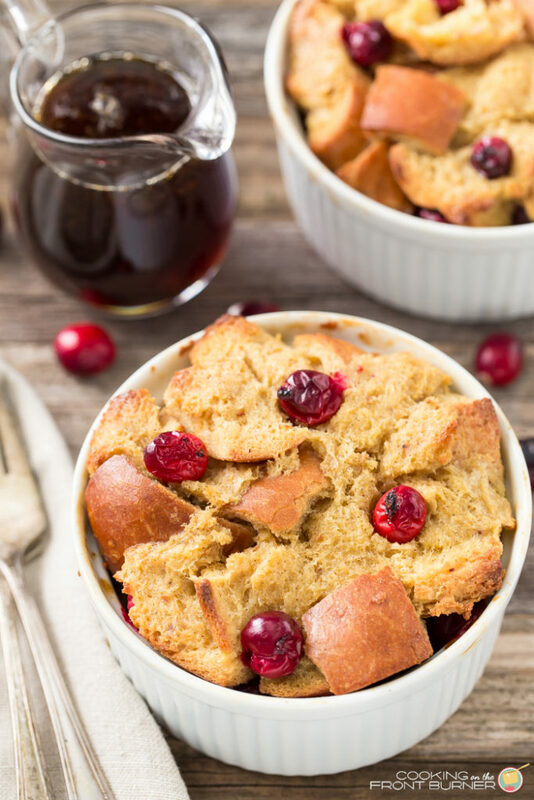 This make ahead Eggnog French Toast recipe is perfect for a holiday brunch. 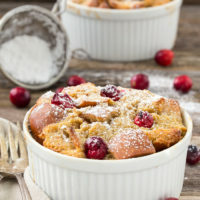 It is full of flavor with creamy eggnog, tangy fresh cranberries and crunchy pecans all topped with an Orange Maple Syrup. Add in the bread cubes and mix well so that all mixture is absorbed into the bread. Divide the bread mixture in half. 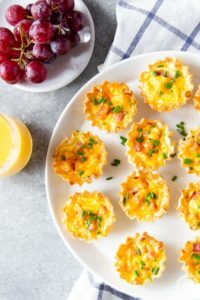 Divide the one half in the 4 ramekins, then add 4 cubes of cream cheese, 1 tablespoon pecans and divide the chopped cranberries over the first layer. Divide the second half of bread mixture over the 4 ramekins and cover with plastic wrap and refrigerate overnight. 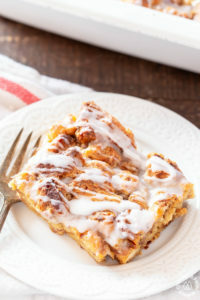 This can also be made in a 8x8 square baking dish. If so, you may want to add additional cranberries, cream cheese and pecans in the middle and cranberries on top. So good! Thanks for linkin' up with What's Cookin' Wedenesday! That looks so yummy! What a nice, warm breakfast that would make. Thanks for sharing it with us at the Funtastic Friday linky party!